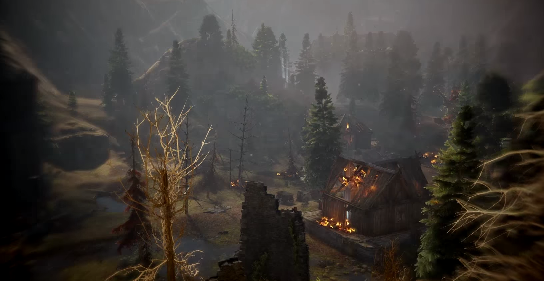 - The Hinterlands is a massive area, and there are a lot of quests to do. You can find a listing of them here. This article will guide you to quests that are in the path of the main quest, but there's plenty more to see off the beaten path as well. - Upon arrival at the Hinterlands you'll meet Harding, the Inquisition's go-to scout. Harding is largely a pro, but if you're consistently friendly - and a little flirtatious - you can start up a minor romance with the dwarf. After you're done talking you'll receive three quests - Holding the Hinterlands, Master of Horses, and Rifts on the Outskirts - which you can complete in tandem with The Threat Remains. You'll want to, as you need more Power to progress in the game, and completing quests will earn you that Power. - You'll start off in a small base camp, the first needed for Holding the Hinterlands. Here you can rest in a tent, restock and equip Potions, and inspect your Requisitions. There's also a Requisition Officer standing beside a wooden cart here who can give you the Hinterlands Iron Survey quest. - Head south from the camp and follow the rocky path along the cliffs to the northwest. (Or just jump off the cliffs near the camp. Your call.) There's a crossroads ahead, and entering the general area will trigger a battle between Inquisition soldiers, a few Sellswords, and a Rebel Spellbinder. The Sellswords are basic melee fighters, while the Spellbinder relies largely on cold magic - and is also quite resistant to the same. Try to draw the Spellbinder out of hiding while the Inquisition fighters deal with the Sellswords, as he's the toughest of the bunch by far. - After you deal with the Sellswords the area will be swarmed by four Templars: a Knight, a Defender, and two Archers, all of which appear in a somewhat steepled fashion. Take out the Archers first, as they're quite frail but very annoying. Keep your Rogues and Mages well away from the melee Templars if possible - they're quite resilient, and will take a while to bring down. Mage effects like Shocked and Chilled work really well here. - In the wake of the battle you'll meet Mother Giselle. She'll ask you to try and reason with the parties that want you dead, and no matter how you approach the conversation it will end in pretty much the same way. - Once Giselle leaves you're free to explore the crossroads. Pick up any loot dropped by the Templars you killed, then have a look around the base of the massive statue that dominates the area. At the base of the statue that overlooks the crossroads (which you can claim to officially name the area Crossroads on your map) you'll find a Refugee Hunter who will give you the quest Hunter Pangs. A short jaunt to the east of the statue you'll find a plain 'ol Refugee who will give you the Shallow Breaths quest. - Keep to the main road of Crossroads and you'll find a merchant who offers a variety of low-level wares. Not far from him is a small stone monument that will allow you to Fast Travel to any camps you've set up; keep an eye open for this if you're low on health. - Pop into the homes hereabouts. The house closest to the statue contains the Hunter's View of the Mage-Templar War Codex entry. Check the house next door (it's on a slightly higher level of elevation) to find the Healer's Notes at Redcliffe Crossroads Codex entry. A little ways east is a waterfall, and next to it another house; inside is the Letter Found in a Redcliffe Home Codex entry. Round off your thieving by checking the final house, on the opposite side of Crossroads; here you'll find some assorted loot. - Look on the south side of Crossroads. On a small rise you'll find a Corporal Vale. Speak to him and you can learn more about the state of things in the Hinterlands. - That's all for the Hinterlands as far as the current main quest goes, though there's plenty more for you to do here if you feel like sticking around. You'll need at least four Power to proceed to the next step of the quest, so do some side quests in the meantime. There's a link to the quests available via the Hinterlands at the top of the page, and most are quite simple. - Head for the War Room in Haven. (You may also want to speak to people around Haven, as there will be additional conversation opens available.) Doing so will trigger a cut scene outside the Chantry. Chat with Cullen if you want to get in on the fun; otherwise, step into the Chantry. Speak to Mother Giselle on the left side of the hall for the quest Lotus and Roots, and chat with Josephine to establish your personal history, then settle in for a War Council. - Once in the War Council, pop open to the Orlais side of the map and choose the operation Address the Chantry in Val Royeaux. It will cost four Power, and doing so will immediately transport you to Val Royeaux itself.